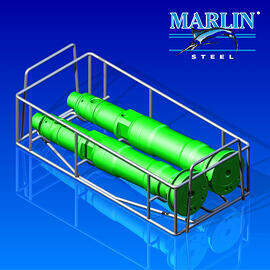 Marlin Steel creates the best material handling baskets or containers to meet your specific needs. 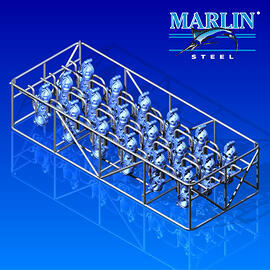 From steel wire mesh to perforated sheet metal, Marlin Steel’s mechanical engineers have years of experience in designing and building the best custom baskets for materials handling for a variety of needs. For example, baskets can be made with special coatings for use in the pharmaceutical, medical, and automotive industries, or soft PVC coatings to ensure that your ultra-delicate and expensive parts don’t get damaged. A well-designed material handling basket eases your work flows and protects your precision-engineered parts, saving you time and money. 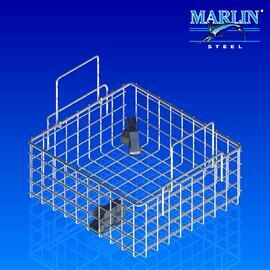 Below are examples of some of the materials handling baskets we have completed. If one does not match your exact needs please fill out the form below with the specific requirements necessary, and we can design the custom product you're looking for. 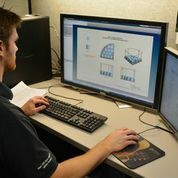 Marlin’s engineers use specialized Autodesk software to test each and every basket design before tooling for production ever begins. By vetting a design in a virtual test, engineers can discover faults without wasting time and money producing a prototype and mailing it to you only to find out that it wouldn’t work and the design needs to be redone. Trial and error with physical prototypes can waste weeks or months, prolonging the time it takes for you to get a basket that will meet your needs. Virtual testing eliminates these delays, saves material, and reduces expenses for tooling since the setup only needs to be done once, after a viable basket design has passed testing. Materials handling containers need to have durability enough to withstand decades of use, and Autodesk virtual testing allows a basket to be tested for hundreds of thousands of uses before you ever lay eyes on it. This ensures your product follows our top of the line standards of Quality.Engineered.Quick®. 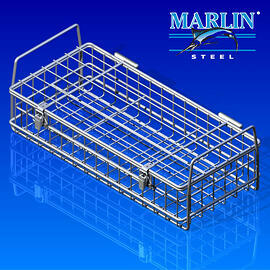 Submit your custom material handling basket requirements and a Marlin Steel employee will get back to you with a quote / more information.